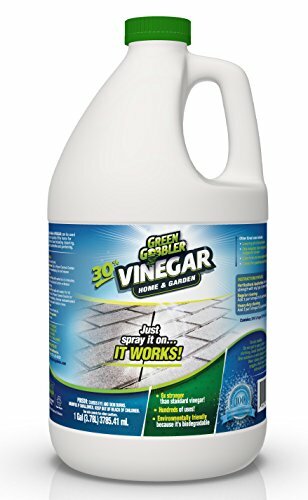 Can you use a vinegar weed killer instead of a toxic commercial spray? Is this type of natural weed killer safe to use and effective? Let’s explore the options. No one loves spraying toxic weed killers on their lawn. At least, I certainly hope you do not. And being a beekeeper, I encourage you to let some of the weeds grow. Weeds such as dandelions provide much needed nectar and pollen for our bees and other pollinators. If you choose to let some of those weeds grow, that means less work for you too! It’s a win-win for all. But realistically, we know that there are some places that you may want to keep weed or grass free. Weeding by hand is hard work and not something everyone has time to do. Over the years, we have seen many commercial products developed to battle the weeds and other vegetative matter around your home. Unfortunately, we are also beginning to see the results of using the easy to apply products. Chemical residues are showing up in our soil, water and plant tissue. And yes, even in our food! Some scientists feel that herbicides are responsible for increased bee deaths. We can debate how bad the problem is but it is clear that a problem does exist. The hunt continues for a way to combat weeds that is less harmful to the environment. Almost any substance that we apply to living plants will affect the environment in some way. As a more natural solution, where does the use of vinegar weed killer fit into our gardening management? Is the use of vinegar effective and safe? Can beekeepers use it to manage weeds in their bee yards? Consider leaving some of the plants that you consider weeds. At least for a time so they can feed our bees. Which Vinegar Should You Use for a Weed Killer? There are several types of vinegar readily available for purchase. Vinegar does not occur naturally. It is most often produced from the fermentation of grain alcohol (ethanol). In times past, molasses, sugar beets or potatoes were fermented to produce vinegar. The 2 common types of vinegar that are widely available are: White Distilled Vinegar and Apple Cider Vinegar. White Vinegar, also called distilled vinegar, has many uses around the house. It contains between 4 – 7 % acetic acid and 93-96% water . The acetic acid is what makes vinegar useful as a plant killer. It draws all the moisture out of the plant. Vinegar can be found in higher concentrations. This stronger product will be more effective as a weed killer. However, it must be handled with extreme care to avoid injury. 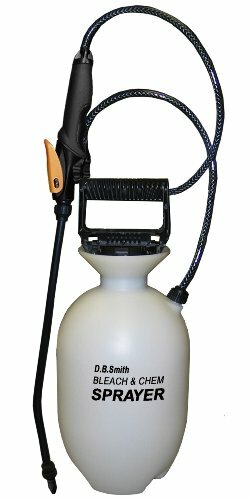 You can also buy commercial vinegar weed killers that are ready to use. Vinegar is generally safe to use with caution. It is used in cooking, cleaning and some health regimes White Vinegar is the one that is most often used in homemade vinegar weed killer recipes. Apple Cider Vinegar is the most popular type of vinegar. It is a mixture of apple cider vinegar and water to create a slightly lower acidity for table use. Pickling strength ACV can go up to 18% acidity – but in general it is less acidic than White Vinegar. Does Vinegar Weed Killer Really Work? Okay, this is the big question. Sure its great that the recipe uses common household items that you will find in almost anyone cupboard. But, does vinegar weed killer really kill weeds? Well, yes and no. You were afraid I was going to say that – weren’t you? Vinegar does not move through the plant like some weed killer sprays do. Vinegar can kill some weeds and other plant material that it touches. But, before you cast your garden weeding woes aside, you need to understand the limitations of DIY vinegar weed killer recipes. Vinegar damages plants by stripping off the wax cuticle of the plant leaf. With no protection to prevent drying out, the plant loses water and dries up. This will NOT however, kill most weeds initially. The root system of the weed will put out new growth that must be sprayed again. If this happens continually, eventually the plant root will be striped of food reserves and the plant will die. Yes. While vinegar weed killer works best on the tender green weeds. It will damage and possibly kill grass and other desirable plants that are sprayed. When using any type of weed killer, use caution and do not spray on windy days. Is Vinegar Weed Killer Safe for Dogs? Most sources agree that areas sprayed with vinegar are safe after a short period of time. The vinegar used will evaporate and should not pose a hazard to pets or foot traffic. Vinegar can be used alone as a spray. However, the most popular recipe for making a vinegar based weed killer includes 2 other ingredients. This DIY Weed Killer recipe requires white vinegar, mild dish-washing liquid and salt. Mix the ingredients well and pour into a spray bottle or hand-help sprayer. Spray a light coat of vinegar weed killer on the weeds/grass you want to kill. It is best to do this on a warm, dry day with no threat of immediate rain. Adding a small amount of dish-washing liquid to the mixture is common. Soap kills bugs – even ones that we like – so use this with care. The soap helps the weed killing vinegar attach to the plant surface. Any type of salt can be used. Salt is well known for drawing water from plant material and will aid in the drying up process. This mixture can kill ANY PLANT – not just weeds. Be careful where you spray it! ** Before mixing or using read the Caution Section of this post for warnings and safety. While the most popular way to use vinegar as a weed killer is by spraying, it can be used as a drench. If you use it to kill undesirable plants in a problem area, add Lime afterwards to bring the soil pH back up to normal levels. How Effective is Vinegar as a Weed Killer? Vinegar can be a part of your effort to reduce weeds around your home. However, it is not a quick fix. Even tender plants may require spraying more than once to kill the root. Not all weeds die. Some of them will only have damaged leaves but continue to grow. This more “natural” way of spraying weeds is good. But, it is not going to work with the same efficiency as well know commercial chemical sprays that are fast and easy. It may be one alternative for beekeepers to use instead of the more toxic chemical sprays. Test on a small area first. Results are variable and unpredictable depending on the climate and weeds present. Vinegar can kill grass and plants we want to keep. Be careful with spray drift. Vinegar week killer can kill bacteria -but, our soil contains good bacteria too – only use as much as you must. Choose your soap component wisely. I use Dawn dish-washing liquid most often. Avoid strong cleaners that contain bleach or phosphates. Vinegar is an acid. Take all the necessary precautions to avoid any health risks. Wear gloves and goggles to prevent accidents. Beware of internet how-tos that tell you to use strong concentrations of vinegar. Treat it with respect as you would any caustic substance.